UPDATE: (12/4/18) The entry for PROS is $550.00 not $500.00. The entry for SPORTSMEN/AMATEUR is $350.00 not $300.00. 1. 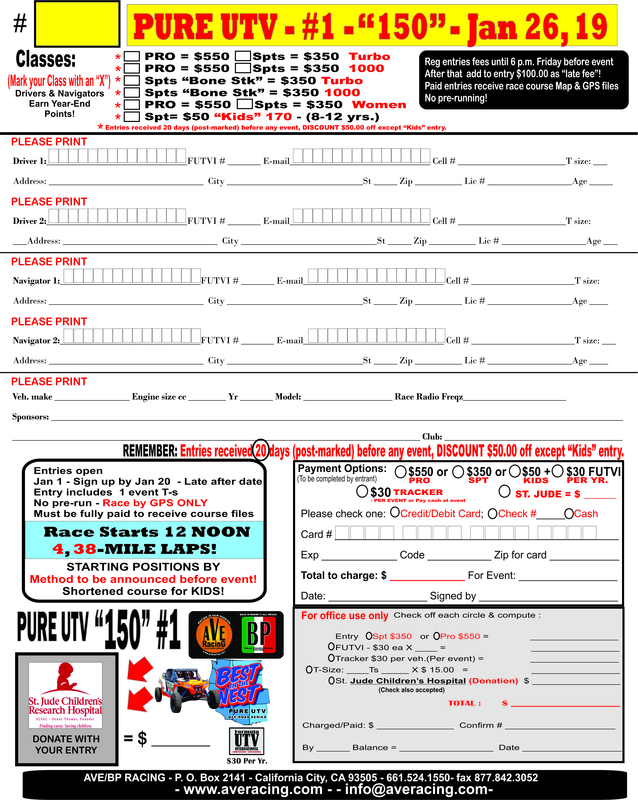 If you sign-up 20 days or more BEFORE the race date, you can deduct $50.00 from the entry fee. Bascally the entry fees will be the same as in 2018. This pertains for the whole year unless we provide information in advance for the necessary changes. 3. If you sign up AFTER 6 PM on the Friday before the event or on race day, ADD AN ADDITIONAL $100 to the regular entry fee. Remember, all events will be as One-Day events, so we want you to be ready when you come in on Saturday and be able to take care of your race-day needs. We are trying to make it easier for you to make your whole racing experience a one-day effort. Of course you can always come on Friday and stay until Sunday at the AVE Ranch, and we would not blame you for it. It's a terrific place to spend a great weekend while you race, at no extra charge. However, additional vehicles with you (frends, family, crew, etc), there will be an extra $10 per vehicle per night. Regualr overnight arking for non-racing affiliated units is $25 per night. There is "No pre-running," of the race courses. Most races will be starting at 12:00 pm (Noon), unless otherwise specfied such as our "Twilite" and "Night" races. Some will feature "bomb-Run" starts, others we will draw for starting positions. ALL WILL BE FUN, EXCITING, THRILLING A KICK IN THE POSTERIOR-MAXIMUS.